Robert Edwards caught up with the up-and-coming Tory MP about social mobility, coalition politics and UKIP. 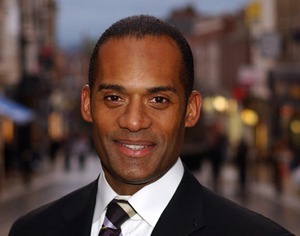 Few politicians embody the social narrative of their party as surely as Adam Afriyie. In a relentless rise from Peckham council estate to Westminster village, the Windsor MP has emerged as the essence of social mobility, aspirational Conservativism and true-blue grit. Elected in 2005, Afriyie has recently bolted out of obscurity – his backbench interventions often provocative, seemingly ambiguous in motive and occasionally at odds with the Tory upper crust. He is certainly suave. Although he’s spent hours in traffic and forgone his lunch, he arrives at Windsor’s Crown Hotel as though from a trouser press – pristinely dressed and poised to spar – and greets me with the kind of handshake that sealed a business fortune rumoured to be around £100m. A world away, in fact, from Adam’s old South London beat, where jobless benefit claimants for Camberwell and Peckham last April numbered 5,306, as against Windsor’s 1,004. Aspiration: I wonder whether he has the word tattooed somewhere. It is shorthand for his whole political outlook – the home-owning, entrepreneurial, rugged individualism of a generation that came of age in Maggie Thatcher’s Britain. Yet things could have been different. Raised on an urban council estate in a large, single-parent, mixed-race family, Afriyie might so easily have been pulled leftwards into the Labour fold. So why the blue rosette? “When I look at people, no matter what their skin colour, background, heritage, sexual orientation – when I look at modern Britain – all I see are people. And people have aspirations. Eschewing socialist solutions, the young Afriyie sought instead to carve out his own destiny, embracing a philosophy that could otherwise have consigned him to Maggie’s dole queues. His own experience, he believes, is a case in point. Aided by good fortune, Adam made his millions in the burgeoning IT industry. What gave him the impetus? “I think it was partly desperation; the need to escape my circumstances. And a lot of it was driven by a sense that I had to become financially secure, so I could take care of my family, my future wife. “Aside from education, I think that business, entrepreneurship, is really the main engine of social mobility. It has to be at the heart of the Conservative narrative. Afriyie may well spurn the barriers of class. But what about race? Born to an English mother and Ghanaian father, he is the first black Conservative MP in the party’s history. Yet Adam, it transpires, is colour-blind. “When we talk about people, we’re not just talking about the colour of their eyes, or their hair, or just their academic qualifications: it’s the totality of a person. To have been elected as the first black Conservative MP, well, it was quite a surprise. And if people are encouraged by it, then I’m happy with that. Really happy. But what unites people is more than a single attribute. Racial inequality, however, remains a stubborn problem in Britain, where black children are three times more likely to be permanently excluded from school, face 24 per cent lower pay after graduation and are five times more likely to be imprisoned. In the main, the black and Asian vote gravitates towards Labour’s urban strongholds. Can the Tories disrupt this demographic trend? “It’s a huge challenge,” admits Adam. “If you look at most newly arrived immigrants in Britain – I’m talking about British citizens, not illegal immigrants – they have an enormous work ethic. They have a huge belief in education; they are very highly represented in small and medium-sized businesses. They’re deeply conservative, with a strong belief in the family. With the general election only a year away, party activists will soon be out imploring voters to hand David Cameron the majority that eluded him in 2010. Should this fail, could Afriyie stomach another coalition with his key local rivals, the Liberal Democrats? “Do I want another coalition? Absolutely not,” he says emphatically. “Coalition is failure. We’ve got to fight tooth and nail for a Conservative majority to get the country back on track. “In terms of the performance of the current coalition: despite the Lib Dems, we’ve achieved about 75 per cent of what we wanted – pretty impressive when your partners aren’t wholly supportive. Afriyie’s own profile in Westminster shot up last spring, after the Mail on Sunday claimed to have unveiled a plot to install him as the next party leader. Whether or not Cameron had genuine cause to beware the Ides of March – or, in this case, January – Adam’s loyalty became a matter of doubt. And Afriyie caused another stir within Tory ranks by tabling a motion to bring forward Cameron’s pledged 2017 referendum on EU membership to this side of the general election. Despite exhaustive lobbying of MPs, Adam could only secure 16 votes in his favour. “The overwhelming majority of people want to have their say,” says the ardent Eurosceptic. “The fact that, out of 650 MPs, not a single one would put forward a proposal for a referendum within this parliament demonstrates the disconnect between the Westminster elite – the political bubble – and the population. For me, it was a matter of conscience. And what of the United Kingdom Independence Party (UKIP), expected to make big gains at the European elections on May 22? “I’m kind of in tune with a lot of these people,” says Adam of those inclined to vote purple. “Many people who choose to vote UKIP are actually part of the Conservative family, and the sooner we can welcome them back, the better. A difficult one for LFF readers. On the one hand, they would like to attack Mr Afriyie as heartless Tory scum, stealing the food out of the mouths of helpless widows and orphans and creating a two-tier society, yet on the other hand, they are faced with the awkward reality that he’s black. We all know that the kind of Left wingers who post comments on these pages see the world in a very simplistic, class-war way. Anyone who votes Conservative is either stupid (they simply can’t see sense), greedy and immoral (they care only about themselves) or are very wealthy (they want to hang on to their wealth) by keeping others down. Never once will you see it acknowledged that many ‘ordinary’ people simply don’t believe that socialism is the way to help people or progress society. That’s actually where the vast majority of Tory voters are positioned. Being faced with the reality of Tory supporters like Mr Afriyie brings home this uncomfortable reality for Socialists. Millions of people voted Conservative at the last election. Amongst them are plumbers, taxi drivers, teachers, and ethnic minorities. Smuig git. The Conservative benches are packed with self made millionaires like him, half of then in the Cabinet. But he’s right about BAME thinking carefully about which Party is the aspirational Party for them. On the one hand, they would like to attack Mr Afriyie as heartless Tory scum, stealing the food out of the mouths of helpless widows and orphans and creating a two-tier society, yet on the other hand, they are faced with the awkward reality that he’s black. Ah right-wing strawmen. So numerous and so wrong. For the record, I wouldn’t hold back from criticising Mr Afriyie because he’s black and I don’t think he’s heartless. Merely naive. Who’s ‘we’? And could I see a source for your contention about ‘Left wingers’ please? Never once will you see it acknowledged that many ‘ordinary’ people simply don’t believe that socialism is the way to help people or progress society. That’s actually where the vast majority of Tory voters are positioned. I’m sure Afriyie’s heart is in the right place (so-to-speak), but that comment just shows that he hasn’t thought through what his oppnents actually believe. People weren’t better-off on benefits before your government came into office. This is a myth that your side peddles. What does he mean by an EX-grammar school. Would that be a comprehensive? ?